Christmas is less than a week from today, we got all presents (not yet wrapped!) and still have some projects to finish. This morning I woke up at 5:30 am to finish the rest of these 30 wood-burned ornaments. I started this project last week and been working very slowly becasue I have to do this without my daughters around. The woodburing tool is SUPER HOT and dangerous! I got these wood tags from Pick Your Plum a while ago and been sitting in the box. I saw lots of peope do wood-burning projects on wood chips or branches. And I thought… Hmmm… This might work with those wood tags. So I did some tries and ended up with this trick: second generation stamping and tracing. First, I stamped the quotes from Reason for The Season stamp set and Merry Merry stamp set with Brown Staz-On ink (second generation), then I traced them with Plaid Wood Burning tool. Finished them with some baker’s twine. This is a simple and easy project as gift. I had too much fun & joy making these ornaments to give to our Church families as gifts together with they Christmas cards this year. I hope you all have a wonderful week preparing for Christmas, to celebrate the birthday of the Lord and our Savior. This Christmas I would love to send out handmade cards to family and friends and for sure it is a challenge. 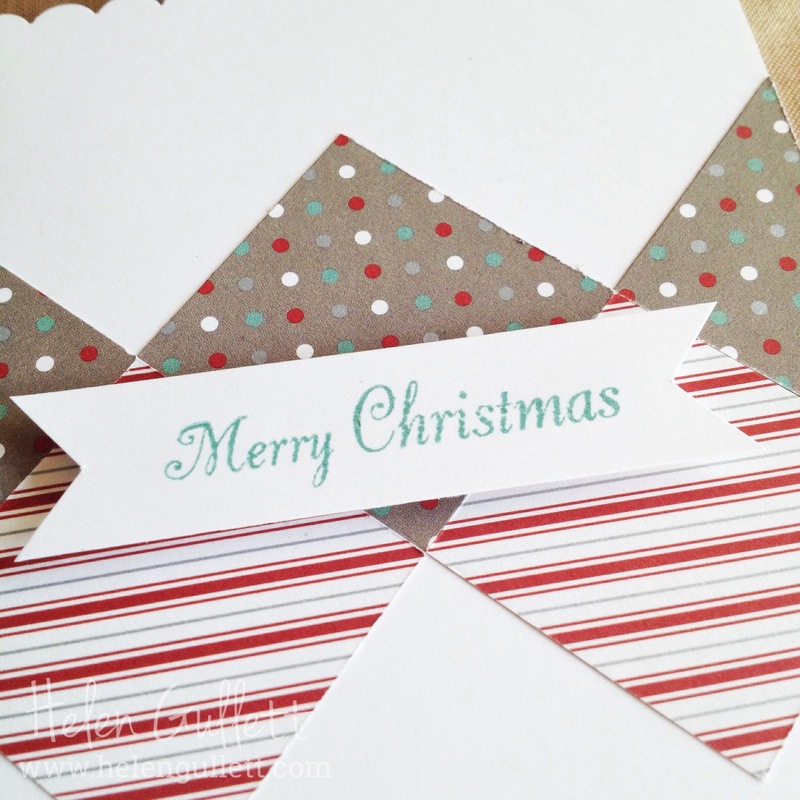 I am so thankful to be able to learn some new cardmaking technique from amazing card designers at Onlice Card Classes – Holiday Style class past week. Today I’d like to share some cards I made in the class. I skipped this session because I do not hav any cute and whimsical stamp set but I LOVE all the tutorials from the teachers 🙂 Defiently in the future I will make some cards. And in this class, the teachers amazed us with their fabulous cards by only using 1 stamp. They show us how to show the “WOW effect” from making Holiday cards this season. I have so much to catch up with this class but in there are LOTS of gorgeous inspirations from the students as well. And I have 2 more weeks to get all cards ready to mail out. Hope you all have an amazing weekend after Thanskgiving! 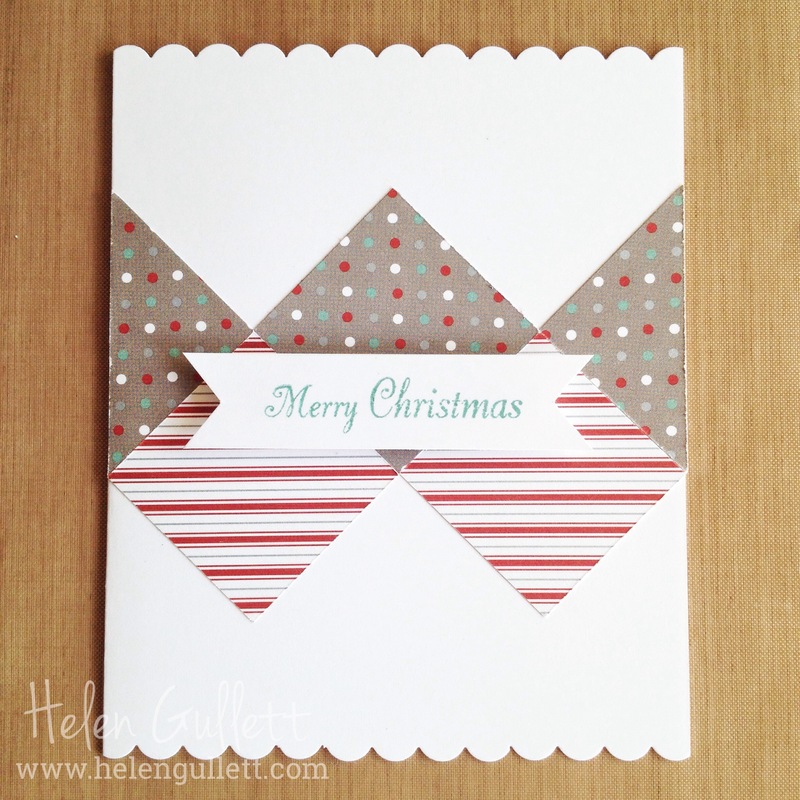 For this card I used CTMH last year Christmas theme paper packet, Sparkle & Shine. The front sentiment, Merry Christmas, is from Sing Glory (hostess reward stamp set, C1587) and stamped it on a piece of White Daisy cardstock using Lagoon exclusive ink stamp pad. After that, I cut the banner tail using Non-Stick Micro-Tip Scissors and added the banner on the card with 3D Foam Tape. 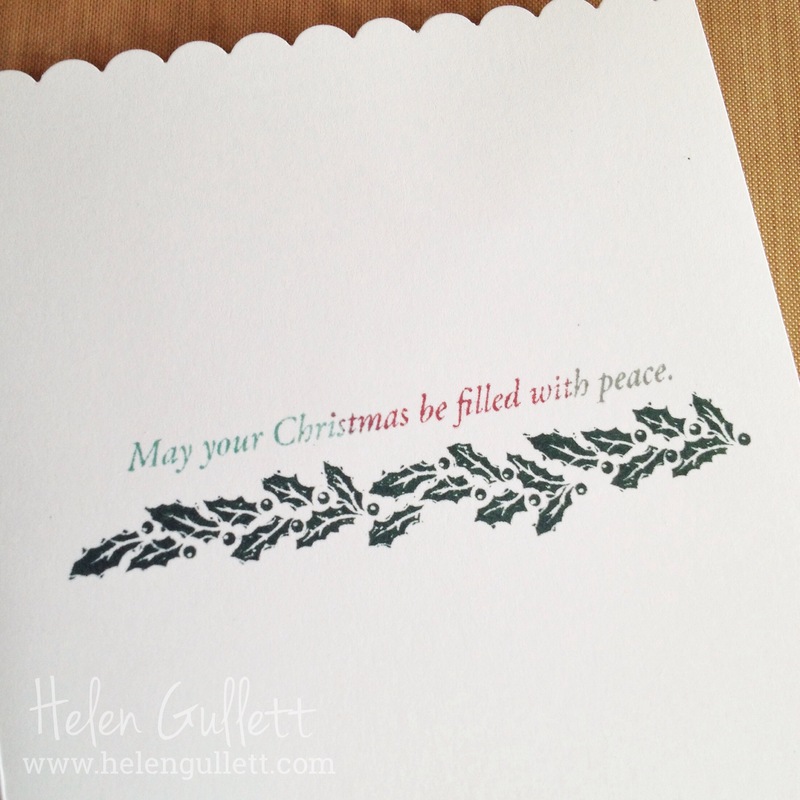 The inside card, I stamped the Holly Leaves border from Sing Glory set using Panderosa Pine exclusive ink stamp pad. And using Kleenex tissue paper, I added Lagoon, Ruby and Slate inks on the message stamp. I am using White Daisy cardstock for the card base. And then I punched the top and bottom card using Scallop Border Punch. All the supplies I used for this card are from Close To My Heart.